CarGurus has 113,610 nationwide Escape listings starting at $999. An all-new infotainment system named Sync 3 aims to correct the sins of technology past and solidify the Escape’s place in the compact crossover segment. 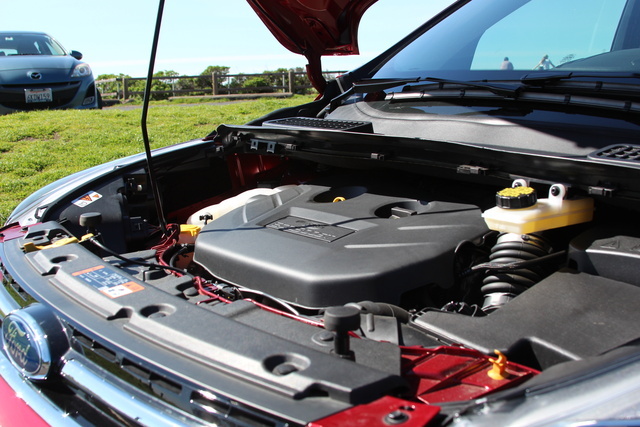 In one of the most competitive segments in the automotive landscape, the Escape is a stalwart fixture, enjoying continuous production for the last 16 years. In that time, we’ve seen the majority of SUVs take the same approach of car chassis and truck body to deliver the best of both worlds with only a slight penalty to either design’s performance or usability. It’s no surprise then that the Escape is among the best options out there, with agile handling, stout engine options, and comfortable seating. The compact crossover segment can get a bit visually repetitive, with different models easily mistaken for one another. And while the Escape isn’t a large departure from the compact-crossover norm, it still presents a handsome profile with some distinctive styling inside. 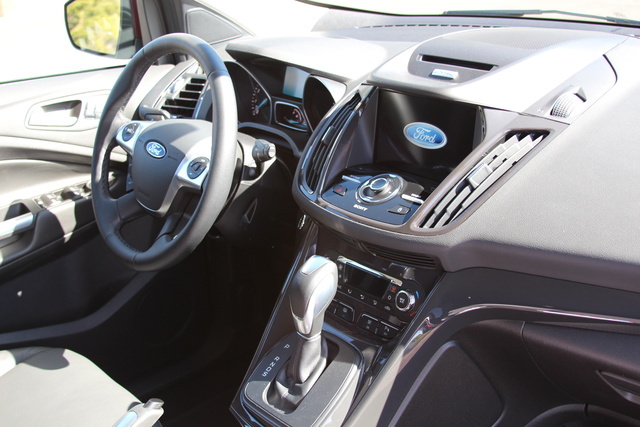 Whether that styling is up your alley is a matter of preference, with many consumers finding the interior design of the current Ford lineup a bit brash, but there’s certainly no way you’d confuse a Ford with a competitor’s offering once you opened the door. At the base level, the Escape starts with the S trim, which includes surprising standards like a tilt-and-telescoping steering wheel, rear-view camera, blind-spot monitoring, and MyKey parental controls, which allow you to set limits for teen drivers. The S trim is powered by a 2.5-liter, naturally aspirated 4-cylinder engine. The SE trim adds 17-inch alloys, automatic headlights and fog lights, an 8-way power driver’s seat, and satellite radio and moves up to the 1.6-liter EcoBoost turbo engine, while the Titanium trim takes the options of several packages and adds its own features. The Convenience Package gets you rear parking sensors, dual-zone auto climate controls, a 110-volt outlet, roof rails, a 9-speaker stereo with dual USB, and the Sync 3 system, while a Leather Comfort Package offers heated mirrors, front seats, and of course leather upholstery. A Cold Weather package is similar, but drops the leather for wiper de-icers. All of this comes with the Titanium trim, which adds keyless entry and ignition, 8-way power for the front passenger seat, a 10-speaker Sony stereo with HD Radio, a power liftgate with foot sensor, an auto-dimming rear-view mirror, and ambient interior lighting. For that, you’ll have a starting MSRP of $29,505, but for my week with the Escape, I was handed a Titanium trim with a few choice extras. Ruby Red Metallic paint added $395, while 19-inch alloy wheels contributed another $695 to the price. 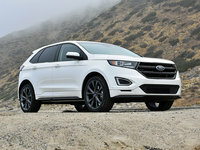 For the addition of the 2.0-liter EcoBoost turbo engine, another $1,195 was tacked on, and a Technology Package equipped the Escape with HID headlamps, blind-spot detection, auto wipers, and active park assist for another $1,735, while moving from front-wheel drive (FWD) to all-wheel drive (AWD) added $1,750. With the $795 navigation system and an $895 destination charge, final price came to $35,530. Unlike many competitors, the Escape has multiple engine options all fitted to the composed and responsive 6-speed SelectShift transmission. Base S trims are fitted with a 2.5-liter engine good for 168 horsepower and 170 pound-feet of torque, and it’s not wholly underpowered, but unless you’re absolutely set on getting the S trim, there are better options. SE and Titanium trims come standard with an EcoBoost 1.6-liter turbocharged four that’ll deliver 178 hp and 184 lb-ft of torque. That’s a nice bump, especially in the torque department, but even better when you consider that the 1.6 gets better gas mileage than the 2.5’s 22 mpg city/31 highway. Comparing apples to apples with regard to FWD, the 1.6 will deliver one better on either end for 23/32, dropping to 22/29 with AWD. But the real winner here is the 2.0-liter EcoBoost engine, turbocharged for 240 hp and 270 lb-ft of torque—enough to send the Escape to 60 mph in just 7 seconds, which is a standout time for the class. Even better, there’s not much of a mileage penalty here for all that extra power. Equipped with FWD, the 2.0 still offers 22/30 mpg, and AWD versions are capable of 21/28. Those are impressive numbers to maintain when you consider the 2.0 adds 62 hp and an incredible 86 lb-ft of torque. Even better, the chassis is actually able to handle all that power. AWD versions are confident and capable on nearly any terrain, but don’t discount FWD. I’ve driven several Escapes through snow and ice with just FWD, and I’ve been very impressed with its capabilities. If you live in climates where you don't have to worry about deep snow, I’d strongly consider FWD. Crossovers are all about room, and the Escape has it. 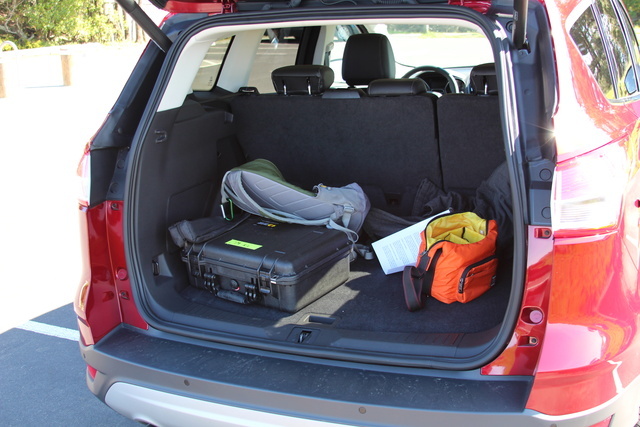 While some rivals beat it with regard to overall volume—notably the CRV and RAV4—the Escape’s 34.3 cubic feet of rear storage and 68.1 cubes with the rear seats folded is still competitive, falling only a few cubes behind class leaders. More than that, the seats are both comfortable and supportive, producing no noticeable fatigue during hours on the highway, in stop-and-go traffic, or even during aggressive jaunts through the canyons. The interior design has been the most divisive element the Escape has to offer, with its distinctive appearance making it a visual standout in the class. Not everyone, however, has been happy with the very mecha-inspired layout of the Escape, finding it too busy and a bit lacking in the ergonomics department. 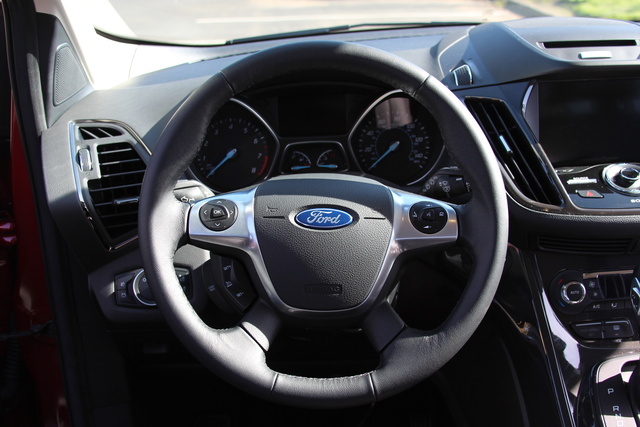 Climate controls especially have been called out for requiring a difficult reach, blocked by the shifter when in Park, and the touchscreen is a long way from the driver, requiring a stretch for proper operation. 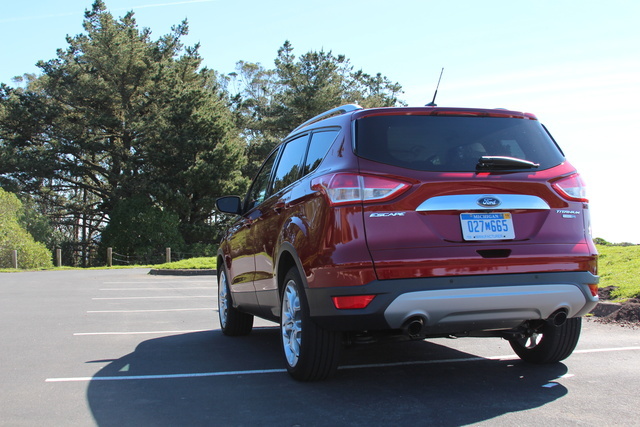 It has the usual Ford fit-and-finish issues, but they're not excessive for the entry-level price of the Escape. But since a tricked-out Titanium trim can run closer to the 40-grand end of the $30K range, some of these small issues can be a big annoyance. One of the biggest annoyances of the entire Ford lineup used to be the MyFord Touch interface, which was laggy, slow, and prone to failure. The Escape now gets the updated Sync 3 interface, powered by BlackBerry as opposed to Microsoft’s handling of MyFord Touch. While Sync 3 is a big improvement with regard to usability—it’s now stable, responsive, and intuitive—the design still looks very primitive compared to the offerings of competitors, and the reach to the touchscreen is still an uncomfortably long one, even for taller drivers like myself. The Escape comes with an impressive group of standard features such as a rear-view camera, blind-spot monitoring, and the MyKey parental control system, which allows owners to adjust settings for a multitude of features. This is aimed at parents who allow teenage drivers to borrow the car. While the more aggressive abilities of the system allow you to limit top speed, radio volume, and radio-station options, some of the lesser-known capabilities include providing increased warnings for a lack of seatbelt use or low fuel, and even restricting the ability to disengage safety features such as parking aids, blind-spot monitoring systems, and traction control. The SE trim adds automatic headlights, fog lights, and satellite radio, while the top-tier Titanium trim gets you the rear parking sensors, dual-zone automatic climate controls, a 10-speaker Sony stereo with HD Radio, keyless entry and ignition, and the foot-activated power liftgate. For the full experience, you’ll have to add the $1,700 Technology Package for the HID headlamps, blind-spot detection, auto wipers, and active park assist—not a bad deal for what it adds—but the Escape doesn’t exactly suffer from poor visibility, so I’d drive one before deciding it’s necessary. And of course there’s the aforementioned Sync 3 interface and the accompanying navigation system. While a big improvement over MyFord Touch, I still can’t recommend it at this point. However, while it failed to launch with either Apple CarPlay or Android Auto, 2016 models will receive an update at some point later in the year that will add these apps, allowing you to essentially mirror your phone onto the Escape’s 7-inch touchscreen. It's a shame this won’t just be a standard feature, but this alone may make the $1,700 a worthwhile investment. The Escape has come with a perplexingly mixed bag of safety scores. 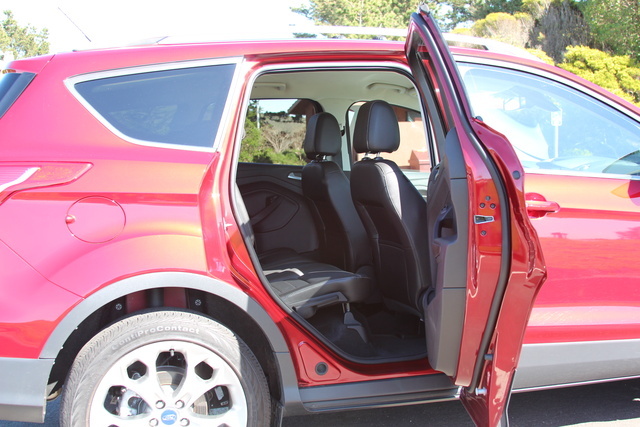 Despite a wealth of safety features, standard antilock disc brakes, traction and stability control, and a full suite of airbags, including driver’s knee, full-length side-curtain, and front seat side, the Escape managed only an overall 4-star rating from the National Highway Traffic Safety Administration (NHTSA), with a 4-star rating for overall front tests and a 5-star rating for overall side tests. But it’s the Insurance Institute for Highway Safety (IIHS) tests that really give me pause. While moderate-overlap frontal-offset, side-impact, and roof-strength tests all garnered the top rating of Good along with the Escape's seat and head-restraint design with regard to protecting occupants against whiplash, it received the lowest score of Poor in the small-overlap frontal-offset test. Still, with an impressive list of safety features and a very competitive 115-foot 60-0 mph braking distance, the Escape should do a very good job keeping you out of accidents before they even happen. While you can get into an Escape for just a bit more than $23,000, if you pick the Titanium trim and are liberal when faced with the options list, you could easily push the price uncomfortably close to $40,000. At that point, you’re bumping up against a whole new crop of options. But within its own competitive segment, it’s hard to find a vehicle that offers the same blend of ride quality, performance, and utility in one package. Ford has also just announced a 0% APR deal when purchasing or leasing a 2016 Escape, with the option of $2,000 cash back, so if you’re looking for a compact crossover, now’s a good time to check out your options. It's been named a Best Buy several times over its history, and the Escape has only improved over the last 15 years. However, early issues have thrown echoes into its financial future even long after improvements have been made, and this has kept resale values on the low side. 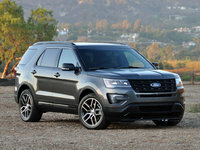 However, with reliability scoring quite high, the Escape has a good chance of weathering these negative impressions and recovering Ford's usually high resale values. A CarGurus contributor since 2008, Michael started his career writing about cars with the SCCA - winning awards during his time as editor of Top End magazine. Since then, his journalistic travels have taken him from NY to Boston to CA, completing a cross-country tour on a restored vintage Suzuki. While his preference is for fine German automobiles - and the extra leg room they so often afford - his first automobile memories center around impromptu Mustang vs. Corvette races down the local highway, in the backseat of his father's latest acquisition. 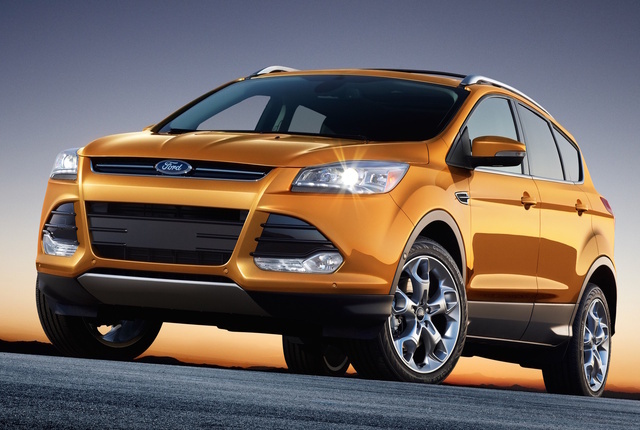 What's your take on the 2016 Ford Escape? cliveg3 Have purchased the 2016 Titanium with the Equipment Group 301A Technology pkg, 2.0L, Trailer towing, and navigation system. Great power, very comfortable and although takes a little time to learn (am still not quite expert at it), I really like the new Sync 3. Previously had a 2005 XLT with V6. The Titanium has much more power and very much smoother. The 2005 was great, had 128,000 when sold and had basically no engine/transmission/ac/drive train problems. Hope the 2016 does as well! Kim Just purchased a 2016 Titanium with the equipment group 301A Technology PKG, Trailer towing, navigation system, AWD with the 2.0L engine. Very nice car ,great pickup and easy system to learn. Love all the safety features for when my teen drives it.First Ford so I will see how it holds up. Annie123456 Bought a 2016 Escape SE with Sync3, NAV package and 2.0L engine with towing package. The bad news is the NAV maps are outdated for my local area. I cross a 2 mile wide bridge that has been in places for 3 yrs .... shows my auto moving over open water then the NAV gives me a new route. Ford tech could not give me a date for new map release.They said... oh it is a new system.... At about $895 for the NAV package... my money would have been better spent to unlimited phone service to use Google Maps as preferred NAV package. RE ED;s question regarding the seats folding: the head rests need to be pushed completely forward to fold the seats flat. The cargo deck after the seats are down could accommodate a person less than 5 ft 10 in or a single person sleeping at a diagonal across the back deck. And the deck would be lumpy due to the back seat trunk divider that covers the seat roll down hardware. Don't think I would want to sleep in it while camping. Users ranked 2016 Ford Escape against other cars which they drove/owned. Each ranking was based on 9 categories. Here is the summary of top rankings. 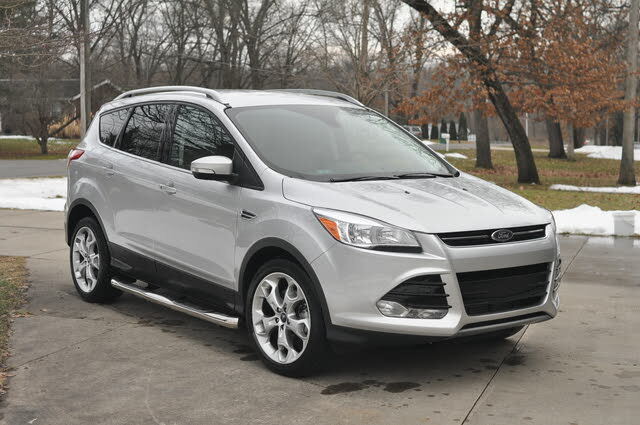 Have you driven a 2016 Ford Escape?